What is the contribution of anthropogenic carbon dioxide to global warming? This question has been the subject of many heated arguments, and a great deal of hysteria. In this article, we will consider a simple calculation, based on well-accepted facts, that shows that the expected global temperature increase caused by doubling atmospheric carbon dioxide levels is bounded by an upper limit of 1.4-2.7 degrees centigrade. This result contrasts with the results of the IPCC's climate models, whose projections are shown to be unrealistically high. There is general agreement that the Earth is naturally warmed to some extent by atmospheric gases, principally water vapor, in what is often called a "greenhouse effect". The Earth absorbs enough radiation from the sun to raise its temperature by 0.5 degrees per day, but is theoretically capable of emitting sufficient long-wave radiation to cool itself by 5 times this amount. The Earth maintains its energy balance in part by absorption of the outgoing longwave radiation in the atmosphere, which causes warming. On this basis, it has been estimated that the current level of warming is on the order of 33 degrees C. That is to say, in the absence of so-called greenhouse gases, the Earth would be 33 degrees cooler than it is today, or about 255 K (-0.4° F). Of these greenhouse gases, water is by far the most important. Although estimates of the contribution from water vapor vary widely, most sources place it between 90 and 95% of the warming effect, or about 30-31 of the 33 degrees. Carbon dioxide, although present in much lower concentrations than water, absorbs more infrared radiation than water on a per-molecule basis and contributes about 84% of the total non-water greenhouse gas equivalents, or about 4.2-8.4% of the total greenhouse gas effect. The 33 degree increase in temperature is not caused simply by absorption of radiation but mostly by the Earth's adaptation to higher temperatures, which includes secondary effects such as increased water vapor, cloud formation, and changes in albedo or surface reflectivity caused by melting and aging of snow and ice. Accurately calculating the relative contribution of each of these components presents major difficulties. Traditionally, greenhouse gas levels are presented as dimensionless numbers representing parts per billion (ppb) multiplied by a scaling factor (global warming potential- GWP) that allows their relative efficiency of producing global temperature increases to be compared. For carbon dioxide, this scaling factor is 1.0. The factors for methane and nitrous oxide are 21 and 310, respectively, while sulfur hexafluoride is 23,900 times more effective than carbon dioxide. The GWP from carbon dioxide is primarily due to the position of its absorption bands in the critical longwave infrared region at 2, 3, 5, and 13-17 micrometers. Methane, nitrous oxide, ozone, CFCs and other miscellaneous gases absorb radiation even more efficiently than carbon dioxide, but are also present at much lower concentrations. 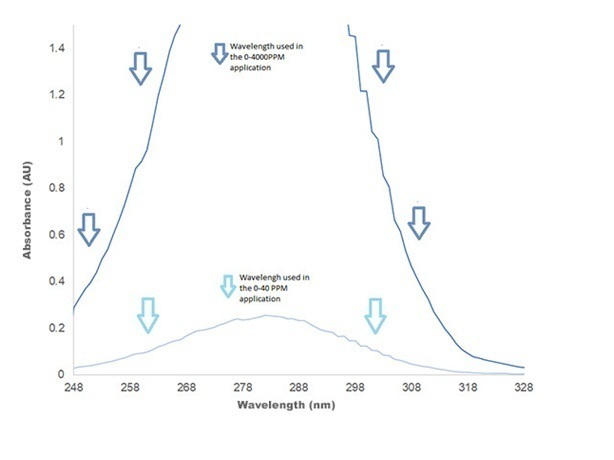 Their high GWP results from their molecular structure which makes them absorb strongly and at different wavelengths from water vapor and carbon dioxide. For example, although ozone is usually thought of as an absorber of ultraviolet radiation, it also absorbs longwave infrared at 9.6 micrometers. These gases account for another 1.3% of the natural greenhouse gas effect. The increase in the global energy balance caused by greenhouse gases is called "radiative forcing". The GWP of a greenhouse gas is the ratio of the time-integrated radiative forcing from 1 kg of the gas in question compared to 1 kg of carbon dioxide. These GWP values are calculated over a 100 year time horizon and take into consideration not only the absorption of radiation at different wavelengths, but also the different atmospheric lifetimes of each gas and secondary effects such as effects on water vapor. 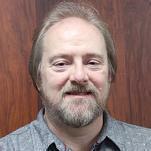 For some gases, the GWP is too complex to calculate because the gas participates in complex chemical reactions. Most researchers use the GWPs compiled by the World Meteorological Organization (WMO). Even though most of the so-called greenhouse effect is caused by water vapor, about 1-2 degrees of our current empirically-measured temperature of roughly 288 K (59° F) can be attributed to carbon dioxide. Water vapor is at least 99.99% of 'natural' origin, which is to say that no amount of deindustrialization could ever significantly change the amount of water vapor in the atmosphere. Thus, climatologists have concentrated mostly on carbon dioxide and methane. Figures from the U.S. Department of Energy show that the pre-industrial baseline of carbon dioxide is 288,000 ppb. The total current carbon dioxide is 368,400 parts per billion, or 0.0368% of the atmosphere. The ocean and biosphere possess a large buffering capacity, mainly because of carbon dioxide's large solubility in water. Because of this, it's safe to conclude that the anthropogenic component of atmospheric carbon dioxide concentration will continue to remain roughly proportional to the rate of carbon dioxide emissions and therefore is in no danger of being saturated, which would allow all the emitted carbon dioxide to go into the atmosphere. Of course, climate, like weather, is complex, nonlinear, and perhaps even chaotic. Increased solar irradiation can lower the albedo, which would amplify any effect caused by changes in solar flux, making the relation between radiation and temperature greater than linear. Increased temperatures also cause increased evaporation of sea water, which can cause warming because of water's greenhouse effect, and also can affect the radiation flux by creating additional clouds. 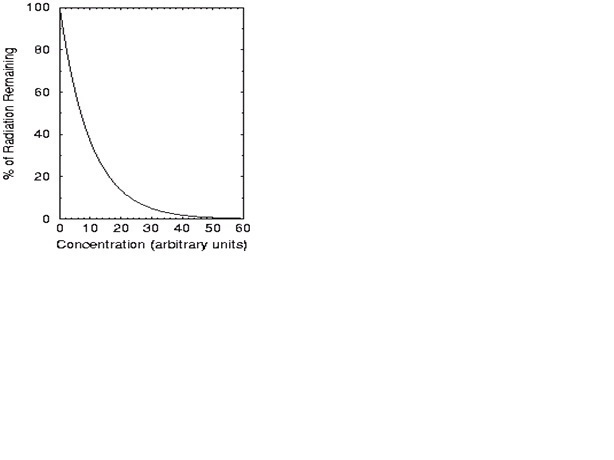 Figure 1: Transmitted light is a logarithmic function of concentration. This curve is the familiar Beer's Law. as the amount of absorbing substance increases. 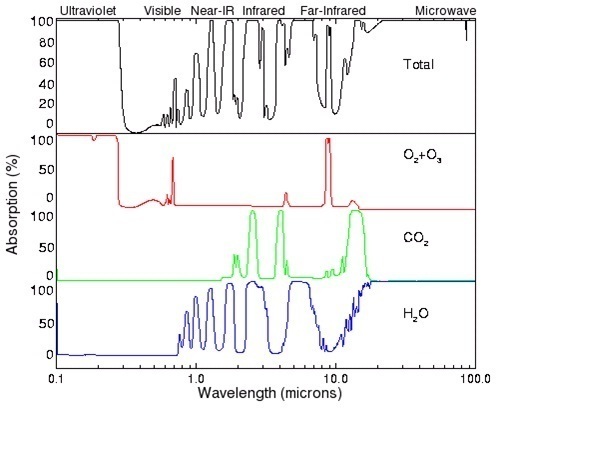 It is generally accepted that the concentration of carbon dioxide in the atmosphere is already high enough to absorb almost all the infrared radiation in the main carbon dioxide absorption bands over a distance of only a few km. Thus, even if the atmosphere were heavily laden with carbon dioxide, it would still only cause an incremental increase in the amount of infrared absorption over current levels. The net effect of all these processes is that doubling carbon dioxide would not double the amount of global warming. In fact, the effect of carbon dioxide is roughly logarithmic. Each time carbon dioxide (or some other greenhouse gas) is doubled, the increase in temperature is less than the previous increase. The reason for this is that, eventually, all the longwave radiation that can be absorbed has already been absorbed. It would be analogous to closing more and more shades over the windows of your house on a sunny day -- it soon reaches the point where doubling the number of shades can't make it any darker. The "saturation" argument does not mean that global warming doesn't occur. What saturation tells us is that exponentially higher levels of CO2 would be needed to produce a linear increase in absorption, and hence temperature. This is basic physics. Beer's law has not been repealed. CO2 is very nearly homogeneous throughout the atmosphere, so its concentration (as a percentage of the total) is about the same at all altitudes. The presence or absence of water vapor has no bearing on whether radiation is absorbed by CO2. Water vapor is a red herring: it has essentially no effect on what CO2 does. Where water vapor becomes important is in the earth's response to CO2. Saturation does not tell us whether CO2 can raise the atmospheric temperature, but it gives us a powerful clue about the shape of the curve of temperature vs. concentration. The linear projection shown here, while obviously simplistic, is a more straightforward argument than those used in climate models, because it does not treat the radiative forcing caused by carbon dioxide separately from the planet's adaptation to it. In other words, we did not just build a model and add carbon dioxide, but instead took numbers that are based on empirical measurements and extended them by a small percentage. 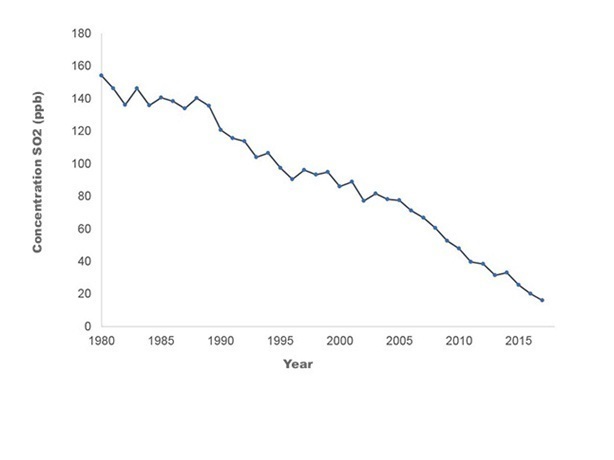 Figure 2: Estimated greenhouse gas-induced global warming plotted against greenhouse gas concentrations expressed as a percentage of current-day values. 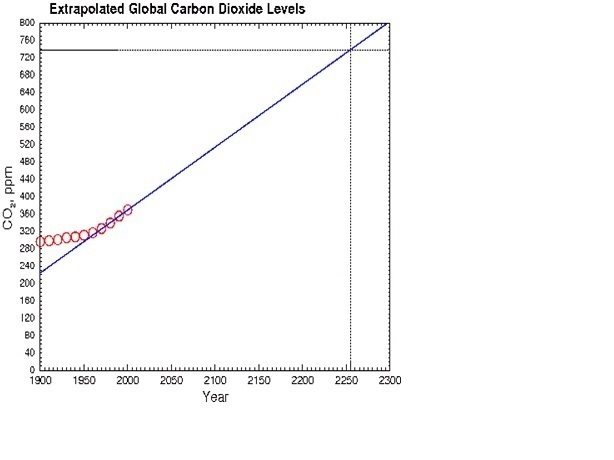 The black curve is a linear extrapolation calculated from the DOE estimates of total current greenhouse gases. The sharp jump at the right is the data point from one computer model that predicts a nine degree increase from doubling current levels of carbon dioxide. would produce an additional warming of (0.042 to 0.084) x 33 = 1.38 to 2.77 degrees centigrade. 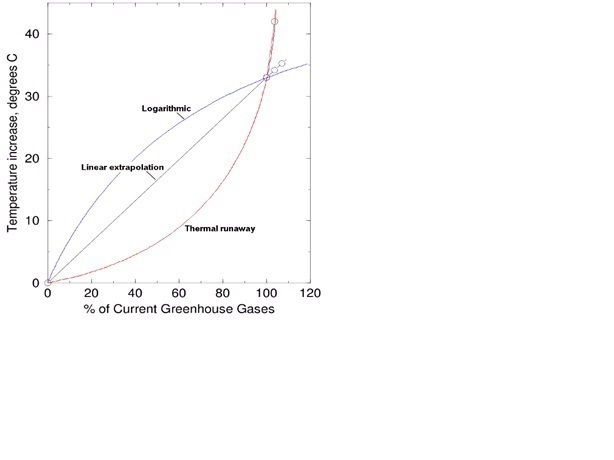 Our calculation also assumes that the increase in temperature is linearly proportional to the greenhouse gas levels. 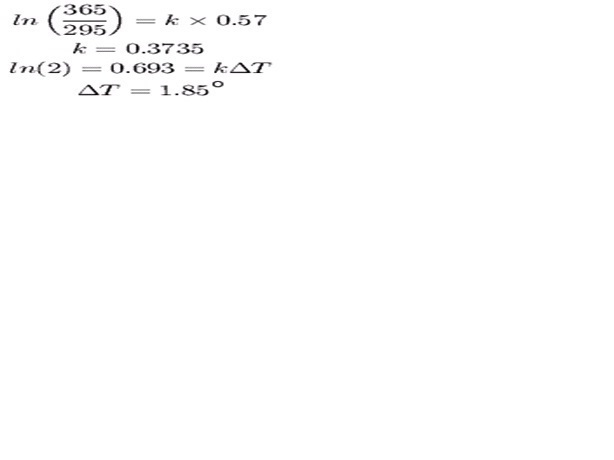 However, as indicated above, the relationship is not linear, but logarithmic. A plot of temperature vs. gas concentration (expressed as a percentage of current-day levels) would be a convex curve, something like the blue curve in Figure 2. Thus, 1.4-2.7 degrees is an upper bound, and depending on the exact shape of the blue curve, could be an overestimate of the warming effect. This 1.4-2.7 degree estimate is comparable to the estimate of 1.4 degrees associated with the "empiricist" school of the University of Delaware, University of Virginia, and Arizona State University. An increase of 1.4 degrees was also predicted by P.J. Michaels and R.C. Balling using the NCAR Community Climate Model 3 model, after the large increases in projected carbon dioxide in the original paper in which the model was described were replaced with more realistic ones. Because a linear increase in temperature requires an exponential increase in carbon dioxide (thanks to the physics of radiation absorption described above), we know that the next two-fold increase in CO2 will produce exactly the same temperature increase as the previous two-fold increase. Although we haven't had a two-fold increase yet, it is easy to calculate from the observed values what to expect. This shows that doubling CO2 over its current values should increase the earth's temperature by about 1.85 degrees C. Doubling it again would raise the temperature another 1.85 degrees C. Since these numbers are based on actual measurements, not models, they include the effects of amplification. These estimates assume that the correlation between global temperature and carbon dioxide is causal in nature. Therefore, the 1.85 degree estimate should also be regarded as an upper limit. 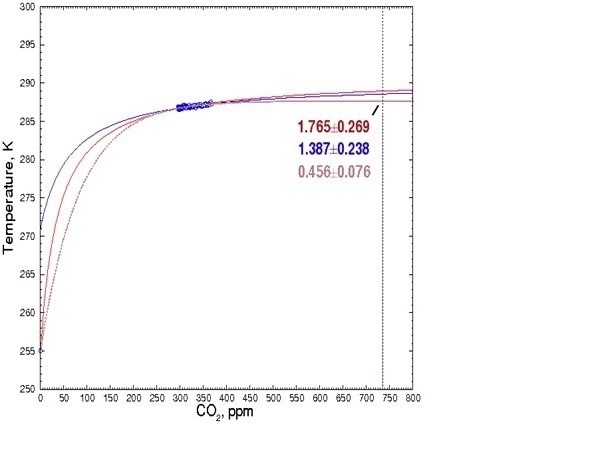 Figure 3: Calculated Temperature rise as a function of CO2 concentration. It goes without saying that the results shown here depend on the accuracy of the original 33 degree estimate and the validity of extrapolating the existing curve out by an additional small increment. However, we can check the plausibility of the IPCC's result by asking the following question: Instead of 33 degrees, what number would result if we calculated backwards from the IPCC estimates? Using the same assumption of linearity, if a 9 degree increase resulted from the above-mentioned increase of greenhouse gas levels, the current greenhouse gas level (which is by definition 100%) would be equivalent to a greenhouse gas-induced temperature increase of at least 107 degrees C. This means the for the 9 degree figure to be correct, the current global temperature would have to be at least 255 + 107 - 273 = 89 degrees centigrade, or 192° Fahrenheit! A model that predicts a current-day temperature well above the highest-ever observed temperature is clearly in need of serious tweaking. What about secondary effects, such as ice melting, changes in albedo, and so forth? Doesn't this increase the predicted temperature beyond the 1.39 to 1.76 degree estimate? In short, no. Because these calculations are based on observed measurements, they automatically take into account all of the earth's responses. Whatever way the climate adapted to past CO2 increases, whether through melting, changes in albedo, or other effects, is already reflected in the measured temperature. Some climatologists, making assumptions about ever increasing rates of carbon dioxide production, assert that the doubling will occur within a few decades instead of a few centuries. However, they are doing sociology, not climatology. The only honest way to estimate the change of CO2 levels is by using a simple linear extrapolation; otherwise, we are merely indulging in speculation about future social trends. At the current rate of increase, CO2 will not double its current level until 2255. Although carbon dioxide is capable of raising the Earth's overall temperature, the IPCC's predictions of catastrophic temperature increases produced by carbon dioxide have been challenged by many scientists. In particular, the importance of water vapor is frequently overlooked by environmental activists and by the media. The above discussion shows that the large temperature increases predicted by many computer models are unphysical and inconsistent with results obtained by basic measurements. Skepticism is warranted when considering computer-generated projections of global warming that cannot even predict existing observations.